Six brothers who are passionate about the craft of baking all work together running the McErlain business in Magherafelt. They grew up surrounded by flour, eggs, butter and yeast in the bakery founded by their parents Joe and Roberta in 1968. They’re still knee-deep in the stuff. They make a vast range of hand-crafted award-winning bakes. They stick to age-old recipes, traditional methods and high-quality ingredients for one reason- taste! Small batches keep the dough soft and moist. Working it by hand gives extra fluffiness. Hand-pressing their butter pastry into the baking trays keeps things light. The bakery is a 24-7 operation. 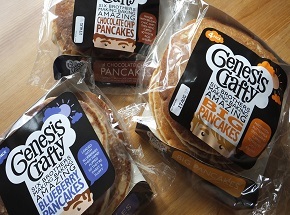 There is the Genesis Crafty range as well as own-label ranges for customers including Marks and Spencer, Waitrose and Sainsbury’s. They employ 220 people with more being added to the payroll all the time. Many including Great Taste Awards, Blas na hEireann Awards and Irish Quality Food and Drink Awards. Great Taste Awards 2015: 3 Stars Brown Soda Loaf, 2 Stars Almond Bakewells and 1 Star Toaster Wheaten, Sliced Oven Wheaten, Round Soda and Wheaten Scones. Many other awards won. Asda, Centra, Costcutter, Dunnes Stores, Eurospar, Mace, Marks and Spencer, Sainsburys, Shop 4 U, Spar, Supervalu, Tesco, Today’s Group, Vivo and Waitrose.